The Artist Reception will take place on Friday, February 1, 2019, at the Bismarck Downtown Artist Cooperative in Bismarck from 6-8 p.m. Artists will be on hand to speak about the motivations and inspirations behind their work. Performances of written works will also take place. Refreshments and hors d’oeuvres will be avilable. The event is free and open to the public. LaRock is a visual artist living in Bismarck, North Dakota. She received her B.F.A. in painting from Minnesota State University, Moorhead in 1998. She works in the areas of painting, drawing, and mixed media. LaRock grew up in New Town, North Dakota. She has been exhibiting her artwork around the United States for the last 15 years. She is a founding and active member of the Bismarck Downtown Artist Co-op, where much of her art is on display. Her work can also be found at the Toasted Frog in Bismarck and the Hotel Donaldson in Fargo. In addition to creating and exhibiting her art, she teaches art through various artist in residence opportunities throughout the state in schools, art centers, and summer camps. 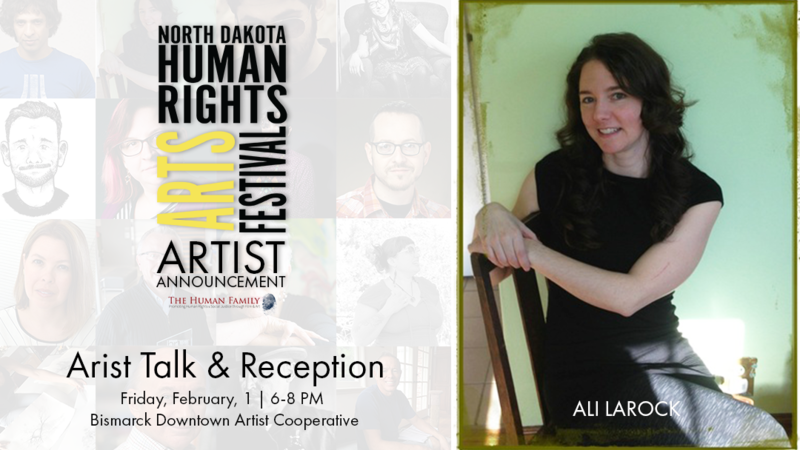 The mission of the North Dakota Human Rights Arts Festival is to educate, engage and facilitate discussion around local and world-wide human rights topics.